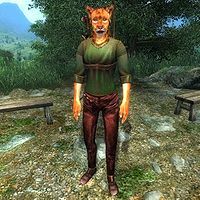 Vajhira is a Khajiit hunter who is a devout worshipper of the Daedric prince Hircine, and can be found with her fellow worshippers Hunting Tail and Boroneth at Hircine's Shrine. Have a chat with her to learn more about Hircine's taste in pelts. Vajhira spends day and night worshipping at Hircine's Shrine, either wandering around or sitting on one of the benches. She wears the rare forester's shirt, laced leather pants and a pair of rough leather shoes. She wields an iron bow with leveled arrows. She also carries an iron dagger and a small amount of gold. Speaking to Vajhira before giving Hircine an offering will make her say "You approach the Shrine of Hircine. Are you hunter, or are you prey?" You will then be given the option to either reply "I am prey" or "I am a hunter." If you choose the former she will say "Then leave here. Run away. Run away quickly. Come back when you are worthy." If you chose the latter she will say, more politely "Do you think yourself a hunter? Then approach the Shrine of Hircine. Leave our lord an offering. Leave an offering of the pelt of a bear, or the pelt of a wolf at the shrine, and Hircine may find you worthy. Or, perhaps you will learn what it is to be the hunted." This page was last modified on 4 January 2019, at 03:46.